Please allow me to trick you for a moment. From 2010 to 2013, Victor Martinez posted a 121 wRC+ in 1801 PA. From 2014 to 2016, he posted a 126 wRC+ in 1736 PA. At the plate, Martinez was just as good from from 31-34 as he was from 35-37. 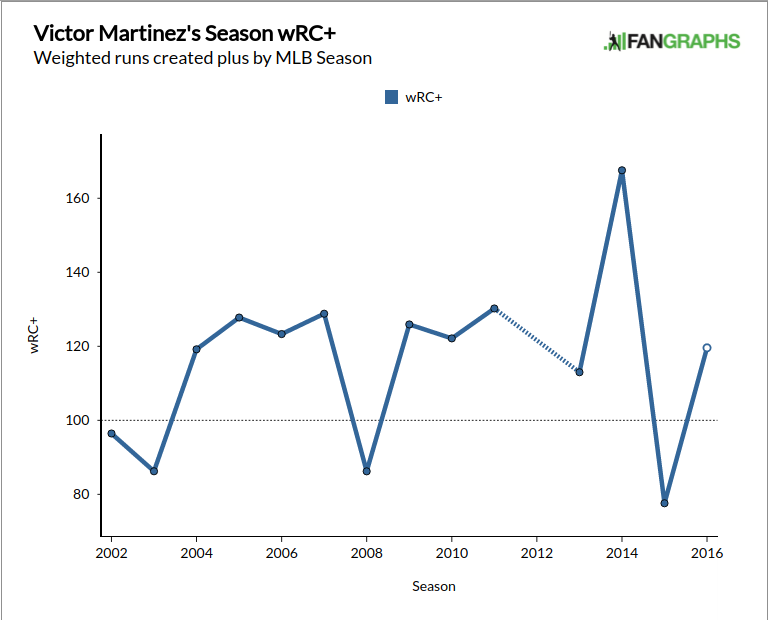 Granted, he’s a designated hitter and a terrible base runner, so being 20 percent better than average at the plate is essentially a requirement, but Martinez has been the same consistent hitter he’s always been. Did you know his career wRC+ is 122. Okay, so I warned you I was tricking you and you’re also probably a person with a memory so you know I’m playing fast and loose with the word consistent. To the graph! The 2010 to 2013 Martinez was quite consistent except for the part about not having an ACL there for a minute. If you take the sum total of that era and compare it to his last three years, it seems consistent but we’ve actually seen three different Martinezes since. In 2014 he was one of the best hitters in the league. In 2015, he was one of the worst. In 2016, he was the normal Martinez again. What should we expect from the 2017 version? If you ask the statistical projections, you get an answer somewhere between 100 and 110. This makes sense, given that he’s been a career 120 wRC+ kind of guy and he’s going to be 38 and two years removed from an awful season. It makes sense that you’d forecast a little decline if all you had were the numbers. So that’s one answer. But let’s try to add some outside wisdom to that. 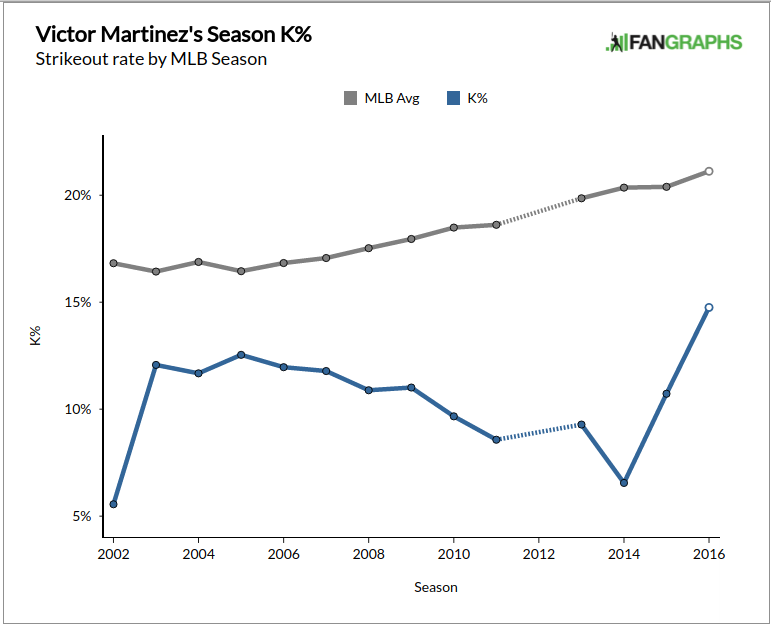 Martinez had knee surgery before 2015 and was clearly not himself for most of that season. We shouldn’t ignore that information – the fact that he had knee surgery two seasons ago is super important – but we also shouldn’t necessary treat performance during injury as the same as performance when healthy. After all, we don’t treat his missed 2012 season as a 0 wRC+. We treat it like he didn’t exist. He got a year older but we have no information about how well he would have played. Imagine if he had tried to play while his knee was healing then, he probably would have sucked! Perhaps 2015 Martinez should simply have sat out most of the season instead of just 40 games. Would you remember his last few seasons differently if instead of watching him play horribly you pined over him while Tyler Collins? I might. If you look at 2013, 2014, and 2016 as his last three seasons you wind up with a projection closer to 135 before adjusting for age and health. Maybe that brings you down to 120-125, which again, is right around the VMart average. It’s a question of whether we want to treat 2015 as valid performance or if we just want to eliminate it and say “second knee surgery penalty.” The odds of Martinez’s knee exploding between now and next October is quite high relative to average, but if his knee does not explode, I think I like the odds of his performance being more in line with his other healthy years. But there’s another thing. I’m also worried about a slightly bad habit he got into when he was hurt in 2015 that carried over to 2016. He’s always been well below average in terms of strikeout rate but the last two years that number has ticked up considerably. I wouldn’t think much of it in 2015 but it got worse in 2016 even as his production came back. He’s started to swing more often at pitches in the zone, essentially at the rate of the rest of the league. This is troubling because it’s been paired with less contact in the zone. He’s swinging at more pitches in the zone but he’s not really making contact with those pitches. Maybe in 2015 when he had no bat speed he needed to be more aggressive, but now that he’s healthy again he should have reverted back to the old Martinez way of never swinging at anything he didn’t like. This is something to watch in 2017. 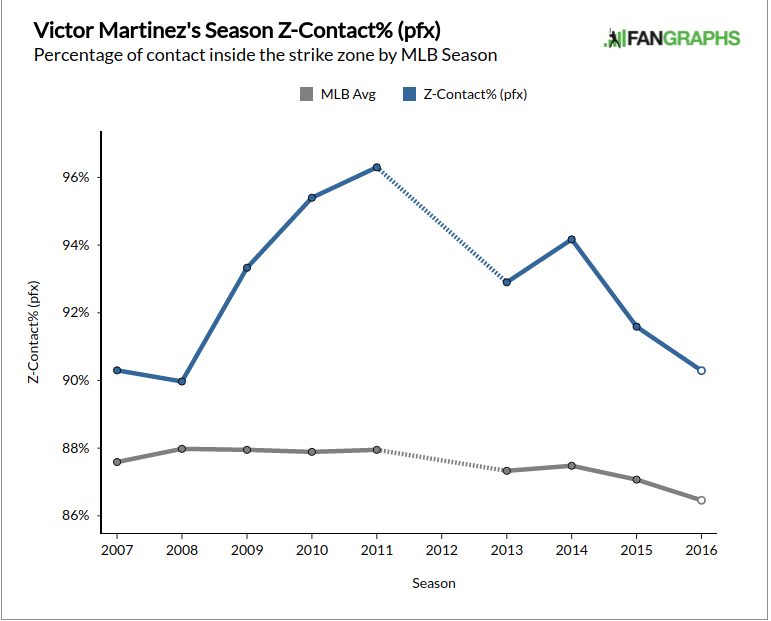 Is Martinez able to be as selective as he was during his peak or is he still chasing those not-very-hittable-strikes? I think it’s plausible we get an injury-hampered Martinez, that we get a 120 wRC+ Martinez, or that we get a really good near-2014esque Martinez in 2017. I’m not qualified to put a number on his health, so just adjust these percentages based on your own expectation. I think I’d wager we get something like 80/20 in favor of the 120 wRC+ Martinez. Even with less plate discipline in 2016 he was still a good hitter. But if he is able to work that out, he showed plenty of power last year to push him into the 140 wRC+ range. 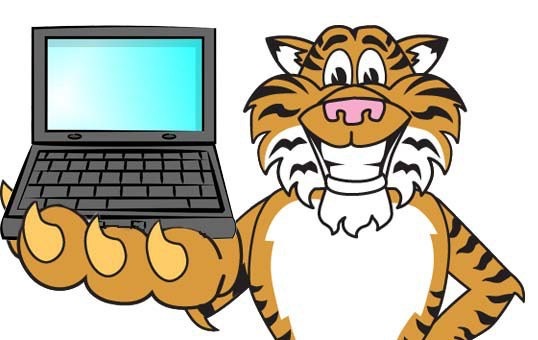 The question is if last year’s power is conditional on his hacking ways – I’ll bet that it wasn’t. The Tigers were very close to postseason baseball in 2016, if everyone pushes a little bit in the right direction they can make it there in 2017, and Martinez is one of the guys with more room to push that most. Hopefully his knee can bear it. I would put his chances at getting hurt measurably higher. An interesting related question is how the money that is allocated to him could be better allocated to win more baseball games. I always thought it was a sucker bet to sign a guy with his injury history, coming off a career year, to a long term lucrative contract.